Klonoa: Nothing a little penicillin won’t fix! These days you’re nobody unless you have a mascot. Nintendo has Mario. Sega has Sonic. Sony has Crash Bandicoot. Snapple has that bottle. Klonoa: Door to Phantomile, may be Namco’s bid in the mascot wars. After playing Klonoa, I really believe they should instead make their mascot one of the guns from Point Blank or Time Crisis. Why you ask? Well, go and play Klonoa. If you don’t experience nausea from the extremely overdone, Japanese-style cuteness then you’ve been playing too much with your Barbie and My Little Pony collection. It’s true! 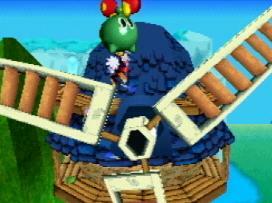 Klonoa takes place in Phantomile, world far too cute and (fortunately) far, far away. A legend in Phantomile says that the energy from people’s dreams is gathered in the Moon Kingdom, and this is why we don’t remember our dreams. Klonoa, the product of a cat and dog crossbreed, has a dream about a big ship crashing into Ben Hill (a hill). One day a ship actually crashes into Ben Hill (the hill) and Klonoa and his ‘ring-spirit’ Huepow go out to investigate. This is where your adventure begins. Klonoa attacks by shooting ‘wind-bullets’ out of his big ring, which his badly named friend, Huepow, lives in. When an enemy is hit, it is inflated like a balloon and Klonoa carries it over his head in triumph, spinning it around for further humiliation. This bloated corpse can then be used as a projectile weapon or as a booster for your jumps. Klonoa can also flap his huge ears, which have weird, finger-like projections at the ends, to slow his descent from jumps. By the end of the game you learn how to work wonders with these few moves. Graphically speaking, Klonoa is awesome. Klonoa is a pseudo-3D game: which means that all the levels are comprised of polygons but you travel in a linear path. All of the gorgeous scenery rotates as you travel around the huge levels creating very impressive visuals. 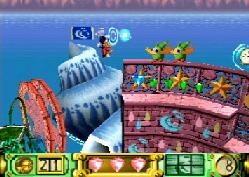 The levels in Klonoa remind me of Mario 64 but without as much freedom. There are parts in most levels where there are branches into the foreground and background, but for the most part the gameplay is 2D. This has been a problem for some games, but Namco has perfected this weird dimensionality. Klonoa runs very smoothly and the times you get confused by the depth are few and far between. Klonoa (the character) and all the creatures in the game, aside from the bosses) are sprite-based. Although this is a bit strange, you don’t notice any lack of depth to the characters. All of the bosses in the game are a joy to fight because of their creative design, huge size, and graphic quality. Once again, the artistry in Klonoa is excellent. Sound and music in Klonoa are pretty average. Klonoa has it’s little theme song but it isn’t anything that I’ll be humming to myself tomorrow (not that I hum the Mario theme to myself for that matter). I’d describe the music as fitting of the game: cute and dream-themed. The story in Klonoa is advanced by cinematic sequences between and during levels. All of the conversation in Klonoa is comprised of annoying-as-hell squeaks and distorted human voices. Huepow’s voice is especially nerve-wrenching: it’s almost exactly like Beaker’s voice from the Muppet Labs (i.e. “Meep-meep-meep! Meep!?”). This is something you definitely want to skip while playing. Control and gameplay in Klonoa is right-on. The controls are very easy to learn, since there are only two buttons used, and you discover new techniques naturally. The camera angles are almost perfect, so at no time do you ever have to perform leaps of faith. Klonoa plays very much like Super Mario Brothers, but with more variety. There are some levels where you ride on rolling carts and slide down waterfalls. There is also a lot of interaction with things in the foreground and background, so you have to keep on your toes. For the most part, Klonoa is very entertaining, but there are a few drawbacks. For instance, there are many parts in the game that younger players will not be able to finish. More specifically, there are many areas where you need very good hand-eye coordination and timing to progress. This is really a huge problem with Klonoa because it’s obvious that the cuteness is geared towards a very young audience; none of whom will be able to get far into the game. On the other hand, the game is too easy for experienced gamers. There is an extra-hard bonus area for aces, but the initial game can be completed in one sitting. There just doesn’t seem to be a good audience for Klonoa. There really isn’t anything ground breaking about Klonoa. We’ve seen all this stuff in one form or another before. It is all done very well, but this definitely isn’t revolutionary. And the cuteness! The horrible, horrible cuteness! Here’s a taste of it from the one of the character descriptions in the instruction manual: “Lephise- The legendary diva who can sing the Song of Rebirth and give life back to the world again.” And here are names of some of the enemies: “Moo, Zippoe, Spiker, Mewmew, Boomie, Dabby, and Shellie.” And who can forget the “Kingdom of Jugpot?” Ugh. This might not sound too awful, but in combination with the cutesy voices and insipid dialogue (where almost everything ends in an exclamation mark), Klonoa can be almost sickening to play. Either way, Klonoa: Door to Phantomile is a strong contender for the worst named video game of the year, as well as the worst names for in-game characters (although Starfox 64 may win that title). Well, that’s about it. Experienced games should rent this puppy before investing the money; but it’s definitely worth a try. If you’re a parent, this should keep your kid out of your face for a long time, although it may be too difficult for very young children. Remember to keep your trigger finger on the mute button!